We jammed and jammed and jammed some more. And in some of the batches of jam, I mixed in cinnamon, ginger, and ground cloves. Oh.My.Goodness. It is so delicious! Spiced Apricot jam on whole wheat toast has been my breakfast and snack of choice the past few days. Every morning with my coffee I'm having this. I also have Apricot Amaretto that's begging to be opened. Let's just ignore those jeans that are tightening up each day. Apricot amarreto? 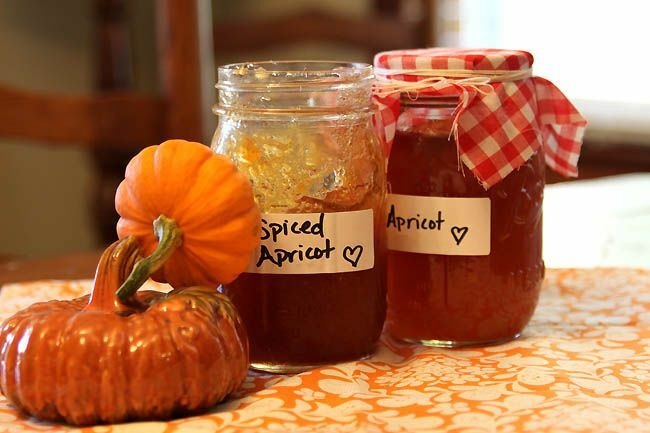 Yummmm...I've had a spread before made with apricot/or peach preserves, amarreto and pecans......I remember it was very good served over cream cheese! Pumpkin anything, but right now what's available are chocolate cheerios; I pour my one-year-old's whole milk over them. Mmmm. Yeah, I sneak the baby's whole milk a lot. Like daily. Wish I could try a bite...or many! Yum! My favorite fall snack is: candy corn and salty peanuts! yum! i am beyond excited to get my first taste of pumpkin spice latte in new york next week... they cruelly keep them from us here! !